To be quite honest, my interest in this season is flagging. Couple this with the inherent difficulty in modeling Idol in a post-DialIdol age and, well, the forecast has a ton of uncertainty. Generally speaking, the safety of a contestant in rounds with multiple performances depends most heavily on their best performance of the night and on the number of times they have previously appeared in the bottom group. The effect of gender virtually vanishes. Votefair becomes unreliable. Tonight’s high WNTS Ratings are all clustered, with no stand-out bad performance. Data and code are linked at the end of the post. My joke last week about how it would be funny if Rayvon kept winning those one-on-one Twitter fights does not seem quite so funny now. Nevertheless, I think he’s toast this time. 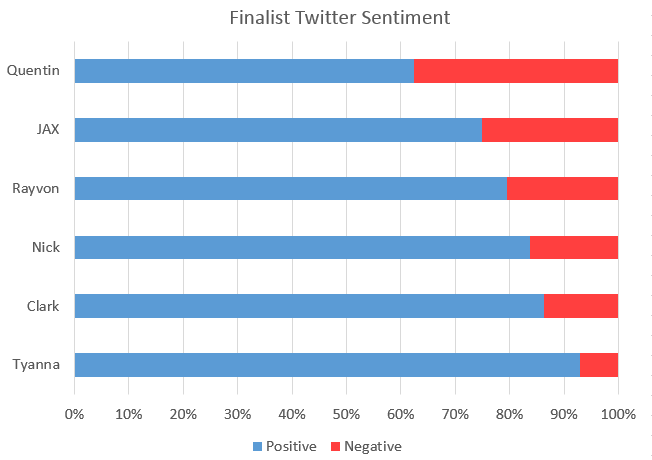 Anyway, Twitter sentiment was somewhat dominated by Quentin’s outburst at Harry Connick Jr. Sorry to hear you’re losing interest in this season. I really look forward to your analysis every week. Keep up the good work! I agree. I know you were a really big fan of Joey (I think) .. Although she has never been my #1 favorite (I’m pulling for Nick), I liked Joey a lot early on but lost a little bit of interest in her as the season progressed. That said, overall I think this is the best group of contestants in a while (I find all of the Top 7 to be very likable). But maybe after a few days you will begin to find something about one of the remaining contestants that you identify with, and you interest with perk back up a bit. Ditto what Kyle said…this is the first site I go to after each show…I love ALL the stats/data/analysis info. Please keep posting. Love your site!!!!! Thanks for the compliments. For all the people who like reading this stuff: I will keep posting forecasts and (mostly snarky) liveblogs. Who knows? Maybe this season will pick up. But I kind of feel they just dumped the most interesting part of the show this year. In the first week, I really hated the Twitter save and felt like it invalidated our votes. I’ve kind of warmed to it, because it adds a little immediacy to the new format. It’s kind of awkward to to eliminate someone, after they’ve sang, based on last weeks vote. This way, at least recognizes the bottom two and lets us vote on the night one of them is sent home. I agree on Joey, she was the only person this season who consistently interested me. A suggestion- I think popularity may be too undervalued in the model (Clark with 51% popularity should be 99% safe in any prediction model). Also- as I mentioned before… giving some weight to ratio or formula that compares WNTS score to Popularity.. may be something worth looking into (ie if someone has very high WNTS score, yet much lower popularity, then they are likely not connecting to viewers/voters enough). Only other suggestion- Facebook stats for the contestants are probably worth some weight to the formula as well… Facebook has a direct link for 20 votes (either on facebook or AI.com, which you sign in to using facebook). Also the demographic of Facebook is likely the largest social media presence of the traditional reliable American Idol voters (tends to be much older than twitter or instagram, and increasingly popular with young moms & women over 50, etc). I enjoy all the stats you apply to your analysis. You’re awesome!!! But after doing some number crunching myself, I’d say Rayvon is most likely safe this week. According to my figures, he and Nick are the only ones showing some measurable momentum over the previous week (although not much). A more likely scenario is that both girls may be in the bottom two. However, the bottom two could include ANYONE who’s tally is below the average which includes Nick, Rayvon, JAX or Tyanna.